I started Total War games with the original Rome Total War, and played the crap out of it, as well as delving more into modding with it than I would any other game up to now. Rome Total War got me very much into Roman history, to the point where I took a year of Latin and Roman & Greek Civilization classes in university just for the hell of it. Admittedly, this is probably true for many of you. However, one real difference is that I did not purchase Rome II at release. The main reasons being I could not afford to dish out the cash for it at release, and at the time I did not think I would have the time to play it much at all. I knew I definitely wanted to at some point though – it being the sequel to one of my favorite games of all time. So, why write this? Put simply, to explain my perspective in hopes that it will help provide insight on why there are diverging views on Rome II and how people’s experience can vary. So, Rome II gets released, and other than what I see on the front page announcements at the time, I didn't really follow it much. I didn't know many specific details, but I heard plenty about how buggy it was and how many people were displeased with it. I won't say any of it is unjustified, but at the time I wasn't into the game in any way so didn't read into it much and thus just didn't care much either. The sale rolls around (March I believe? I hardly remember now.) though and I decide it might not be on sale like this for a much longer, so I may as well purchase it. Remember now that I don't really have much knowledge of what bugs and other issues that most people complained about, only a few broader issues that were hard to not hear about at some point – mainly AI and naval battle problems. But the point is, I'm now going into this game that I have heard plenty of bad things about, but with no real knowledge of the specifics, nor of what any recent patches have maybe been fixed. I tell you all this because it's important to know how I am first experiencing this game compared to how many others did right after launch. Take care not to overlook the importance of that. I pretty much jumped right into the campaign – didn't read up on any sort of guide or manual or anything. One thing I failed to understand enough at first though was exactly how the political system and starting faction/family attributes worked, so my first campaign was doomed because of it. 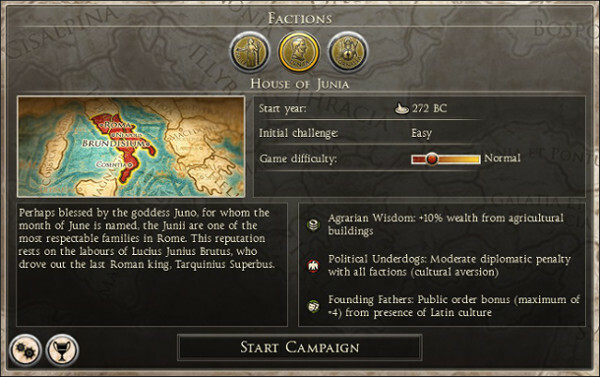 I didn't really get how bad diplomacy would be starting as Rome, House Junia, with their political aversion effect. I thought it would only affect the Roman houses and their political game, not actual diplomacy between all other factions. I didn't notice the connection between this effect of Junia and diplomacy until it was a bit too late. The campaign started off well enough though. I acquired the Italian peninsula with some difficulty but nothing impossible. And that was quite fun. I just messed around with battles and new campaign features during this time, thinking I might eventually restart the campaign once I knew the inner workings a bit better and could get off to a better start. I stuck with this first play through though since it went quite well. But of course, I spoke too soon, and right after conquering Italy I found myself at war with literally everyone with any sort of border to me: all bordering barbarian tribes in the North, half of Greece, Illyrian factions, Massailia, and Carthage. Of course all associated client states and a few random alliances with farther off factions joined in the war as well. I couldn't understand why they were all just straight up declaring war on me. I noticed the negative relation and assumed the aversion was just for being Roman, not specifically Junia. Most declared war when there were barely any negative relations in the first place. So maybe there was some bad luck there too. While I was holding on to Italy well enough, I was at war with too many factions at once to do any sort of offensive campaign. What with how easy it is for armies to cross water, I couldn't let my legions leave the peninsula without leaving it too defenseless. I was stuck in a perpetual defensive war, killing all armies thrown at me, but taking just enough losses for my forces not able to strike back. It became old fast, with just more and more people declaring war on me there was no end in sight and it wasn't fun anymore. I nearly rage quit the game entirely at this point because of this, figuring it was just still as broken as I had heard it was at launch. However, after a few days break I gave it one more shot, taking care not to be Junia, and chose Julia instead, pretty much for the sole reason of no negative diplomatic issues from the start. With the Julia, things got noticeably better. Italy was a bit more trouble to conquer this time, and things actually never heated up early on between me and Carthage, so I never took Sicily early on. I reached a point where I had Italy firmly under control, public order good and my legions supplied and ready, with no enemies except one minor Gallic tribe in the Alps pestering my border (and easily repelled with two otherwise bored legions). It was then I felt better about this campaign, and took a little more care with diplomacy for it. I quickly got a trade agreement with Athens and Massalia, and Syracuse even approached me with a trade agreement and a small sum of money. Eventually, the Gallic Confederation was born and declared war on me on top of their ongoing war against Massalia. Massalia over the next decade upgraded our treaty to a full alliance, giving me leave to keep a legion outside the town to help defend. Now that, I liked. It was nice to have an ally, with a mutual enemy, that I for once felt obligated to help since they were very unlikely to betray me. Diplomacy actually got me somewhere and I had fun with that, on top of it being an ideal situation where it made perfect sense we would be allies. Now this was really the only war I had going on, and I was getting restless, wanting to just do something for the sake of doing it. Defending Massalia was easy; I learned after a few sieges from the Gauls how siege AI definitely wasn't the most intelligent. My legion along with a sizeable Massalian garrison and army, made a good defensive force that didn't need to exploit the stupidity of the AI to win. It was just a fearsome force in its own right. Up until this point though, I hadn't really been able to experience the derp of a naval battle. There were a few small fleet skirmishes from garrison fleets in a few sieges in Italy, but otherwise nothing substantial. So, to do something interesting, I declared war on Carthage. I did not have Sicily and wanted it, and would settle for at least a foothold in Spain on top of that before a peace treaty. I got to experience my first naval battles here against Carthage and its satrapies. Yes, they were full of derp. I don't need to explain how or why if you are reading this. I was quite disappointed with how naval battles played out here. Not enough to rage quit but enough to make the war annoying each time a naval battle did show up. I was careful in my planning though, and made sure I just avoided letting my navies get caught in too many fights and my armies from needing to sail all the time. I got Corsica and Sardina easy enough, and a foothold on Sicily. Things took a quick turn for the worse though, when I took a gamble sending my legion defending Massalia towards Spain to try and attack Carthage there. Massalia fell to the Gauls when I left. I was actually quite pissed, since our alliance had been very fruitful up to that point. The legion went back and took Massallia, and I just decided to govern it myself so I had more influence of Latin culture going towards Gaul. This caused my forces to be delayed and stretched thinner however, and Carthage was still strong enough for offensive strikes. I soon found myself on the defensive when a series of unfortunate events screwed over my farms and food supply, causing my armies to desert at a pretty bad pace. I couldn't go on the offensive at all here, and defensively was barely going well. It was then that Athens came to save the day. They actually offered to join the war against Carthage, in exchange for a fairly small amount of money and a trade agreement. While a good offer indeed, I was reluctant to accept, not knowing the extent they would go to actually help. Worst case, they barely helped and I got screwed over, but they wouldn't gain any territory. The other side of that coin is they help a lot, and while appreciated, I don't want to give up parts of Africa and Iberia to them. I accepted, fairly reluctantly, hoping I could just bounce back from my food shortages and beat them to most territories. As I feared though, they were quite quick in sailing over to beat up Carthage, and they brought Sparta, 3 military alliance allies and 1 client state to the fight with them. I won't bore you with the details of this large scale war that ensued, but Athens and Sparta ended up with Carthage itself, two thirds of Sicily, and all of Libya. They got there very quickly, and I decided to throw my lot into taking Spain with all my force before they got there. That part of my plan worked, Carthage was eventually destroyed and I had all of Spain and parts of Africa to show for it, but now these Greek factions had a lot of Africa as well. And their alliance expanded to include Egypt as well. Now this whole time Gaul was being held off by one legion, still in Massalia, and a second smaller one going back and forth into the forests raiding and occasionally sieging towns. Once my legions could leave Iberia though, Gaul was soon overwhelmed. Fighting the cultural aversion was the most challenging part, the fighting was easy otherwise, but mainly due to Gaul also having trouble with the Germans to the east. I had the hang of things by now, and definitely felt good about how diplomacy was going. I wasn't getting screwed over for any reason; other factions seemed to fear and respect me now and didn't make stupid decisions at random. The great Greek alliance was a growing threat to me though and our relations slowly soured after the defeat of Carthage became but a distant memory to us all. I eventually conquered Gaul completely. Then moved on to Britannia, which was conquered 100% by none other than Gaius Marius. I intended him to force the civil war and become first emperor (sorry Caesar). I was slowly using agents to incite revolts in the Greeks' African holdings, then taking them one by one as they revolted. The Germans were annoying, but I was able to hold them at bay. One town in particular kept attacking repeatedly, and this is really the only place the horrible siege AI came into my favor, winning many defensive siege battles I was horribly outnumbered in. Sometimes I had a full legion there to actually defend it, but you can't stop the AI from being completely stupid each time. The defense was always too easy because of this, and while entertaining because it was so stupid, being devoid of challenge was making it get old fast as well. The civil war eventually broke out, with a province just in Illyria revolting with the senate loyalists, but most of my legions were all back near Italy to help stop them. I lost only a half of my Illyrian holdings for it, and soon regained them and made another minor faction in the area a client state. They actually did quite well killing Germans for me, so I let them stay a client state for a very long time. Soon after all this went down, I had conquered Germania, and now had only to really move on to Greece, the one growing super alliance that could actually threaten me. Well, they might have been a threat at one point, but post-civil war not so much since I was swimming in cash after upgrading my economy in all my provinces except the border near Germania. My legions were all veterans, except for a few freshly recruited ones. Gaius Marius was Emperor and a 10 star general. Things were going well...too well. And that's when I slowly got more and more bored with how easy it was. Diplomacy was still actually quite good, realistic at least, in that everyone realized how damn powerful I was and didn't want to be on my bad side. People were asking each turn to end my war with them for money, or for me to give them some of my vast wealth and become a client state for it. Flattering as it was, it isn't fun when everyone, especially everyone in the one super alliance that could even pose a slight challenge to me now, is begging me to not hurt them. I lost interest slowly...and my campaign still sits there, with me halfway conquering this Greek alliance and Africa nearly all mine. So, why write all this? Why bother with the details? Because, despite the abrupt end of my campaign due to boredom, the time I did play it a lot was quite fun. Naval battles were derp, don't get me wrong, and siege AI was horrible too, but other than that, I found very little else that I didn't enjoy to at least a small degree. Diplomacy, while not perfect, felt more engaging when it wasn't just threats and war being tossed about. I liked actually negotiating something that made sense given the situation, and having the AI pay heed to that and factor that into their decision when negotiating with me. I don't remember any faction declaring war on me at a stupid time, in a stupid way, or doing anything else that you might have expected in old TW games from diplomacy. Perhaps I just got really lucky, and the AI is only this smart 1% of all campaigns, but regardless, diplomacy was actually an enjoyable aspect for once. Naval and siege battles aside, battles were also quite fun. The AI wasn't perfect either of course, but just good enough to force me to really pay attention to what I was doing, and allowing better tactics to win me those battles against overwhelming odds. I liked how global food supply helped with army replenishment, giving me reason to really pay attention to farms and food. The new way settlements are laid out, in regions of multiple small towns and one larger main town, I also really liked. It made city building a little more fun, allowing you to specialize areas or towns for some sort of production. While the building tree could use a little more depth, the way it is implemented felt well done. Battles are fun in Rome II. Sieges are hit and miss. I liked that piracy was now a passive stat affecting your controlled areas of the sea, instead of having random pirates spawn near a port and blockade it with one ship and totally screw your income. I like the different stances armies and navies could take, allowing more strategy that affected battles take place on the campaign map. I liked agents enough, they didn't feel as fun to use most of the time, too easy even with higher level agents, but aside from enemy agents being annoying sometimes, it wasn't so bad. That's essentially the point. I liked Rome II, despite its most obvious bugs; even those didn't feel game breaking at all to me. I worked around them, more or less. While I raged a bit at first, I eventually just went into those stupid moments of naval battles and siege battles and tried to have fun with what I knew was going to be a derpfest. May have taken away from a more challenging, realistic campaign experience, but it was still fun. So in the end, I enjoyed it, and while I can understand how people were frustrated earlier in its lifetime, I think Rome II as I played it recently is actually pretty good, or at least getting pretty close. Hopefully my perspective on my first experience is refreshing or eye opening or...something. Whatever it is to you reading this, what I hope you take away is the knowledge that regardless of Rome II's shortcomings, however significant, does not always mean fun can't be found in one form or another. It's understandable to be frustrated with some things that need obvious work, but the line between constructive criticism and whining is pretty thin. And it all boils down to a matter of perspective. So tread carefully.